Instagram just lifted one addictive feature from Facebook and the other from Snapchat. Instagram Stories started a bit inauspiciously as a very obvious Snapchat Stories clone. But three months in and it’s clearly a success: 100 million people use Stories every day to check their friends’ disappearing photos or add their own. Now the Facebook-owned photo-sharing network is adding a live video feature to Stories, so you can broadcast your life for up to an hour at a time. If that sounds familiar, it’s because Facebook is also betting big on live video in its main app. But some people feel more comfortable sharing photos and videos in Instagram, which offers a more curated experience (and less political crap) than Facebook’s free-for-all of a News Feed. The new live video feature is accessible with a swipe to the right from your main Instagram feed. Where before there were options to record a normal video or take a Boomerang, now there’s also a big “Start Live Video” button. Viewers will be able to add comments as you’re streaming, or you can shut them off if you’d rather broadcast without feedback. Your friends’ stories will still appear in the bar pinned to the top of your feed, but now you’ll be able to see which stories are live because the word “live” will appear on their profile photo. The Explore feed, where you can easily waste hours scrolling through strangers’ photos from around the world, will also curate live videos from popular Instagrammers. Just tap “Top Live” in the side-scrolling top bar to view a random live broadcast. Instagram is also bringing disappearing messages to Instagram Direct, its in-app messaging service. Direct has 300 million monthly active users who can now share ephemeral photos and videos with individual friends or groups, just like they can on Snapchat. 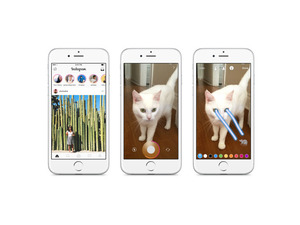 Just swipe right from your Instagram feed to jump into the camera to shoot a photo or video. You can add text or drawings to add a little extra oomph, then choose who to send it to. You can only send disappearing messages to people who follow you back on Instagram. To view your Direct inbox, tap the paper airplane icon in the top left corner. Disappearing photos and video messages will appear at the top of your Direct inbox. This feature adds a whole new layer on top of the Instagram experience, turning the app’s lightweight messaging functionality into a more addictive one. I’m already spending a lot of time in Instagram, and I foresee that skyrocketing when live video and disappearing messages roll out to everyone. The Instagram Direct update starts rolling out around the world on Monday. Live video is coming in the next few weeks.